A new online tool is offering gardeners advice on the pollinator friendly plants that can turn their gardens into a haven for a variety of bumblebee species. The Planting for Pollinators tool aims to increase awareness about the environmental needs of the different bumblebee species and offers practical recommendations on which flowers are attractive to these pollinators throughout the season. Using the Planting for Pollinators tool, you can choose a bumblebee species and find out its favourite plant species. Users can also select a species already growing in their garden and identify which bumblebee species rely on this plant for pollen or nectar. There is even an option to list several plants in your garden to find out what bumblebee species to expect. For the first time ever in the UK, a new book devoted to solitary bees. 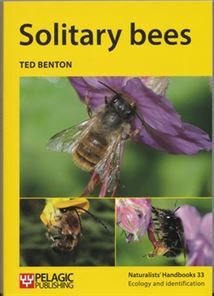 Readable and affordable, suitable for the non-specialist as well as solitary bee devotees. This is not a comprehensive ID guide, but a general introduction to the genera. Full of information and well worth reading. Your garden can provide a source of pollen and nectar to late flying insects long after native wild flowers have finished. This is one of the features that can make gardens specially good habitats. Members of the Daisy family (Asteraceae) are the autumn mainstay - Aster, Symphyotrichum (the new name for North American Michaelmas Daisies), and perennial Helianthus such as the hybrid 'Lemon Queen'. Plant in a sunny, sheltered location. The image shows a Small Tortoiseshell butterfly nectaring from Symphytum cordifolium in my grden on 28th October. 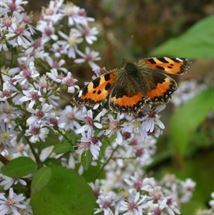 This species of butterfly has suffered a decline in the UK in recent times, possibly because of a disease. When I was younger it was really common, but nowadays I rarely see it. 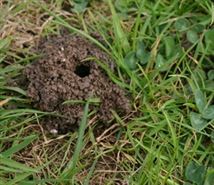 Does the Tawny Mining Bee live in your lawn? This distinctive reddish coloured bee lives in gardens lawns. It emerges in spring leaving small piles of crumbly soil around the hole from which it emerged. You can now submit online records of this bee to BWARS. Our knowledge of the distribution and abundance of this bee is very patchy and your contribution will help its conservation. 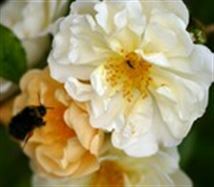 Did you know that some types of garden Roses are used as a pollen source by bumblebees? Try growing one of the following: ‘Frances E Lester’, ‘Goldfinch’ (illustrated), ‘Kew Rambler’, or ‘Veilchenblau’. All of these are large-growing climbers that need plenty of space. More compact are the shrub Roses Rosa gallica ‘Complicata’, and R. moyesii ‘Geranium’. Pick of the bunch is probably ‘Frances E Lester’, which attracts a range of insects including some solitary bees and hoverflies. The first results have been published from the RHS 'Plants for Bugs' project. This tested the relationship between invertebrates and separate groups of plants from the UK, from the rest of the northern hemisphere, and from the southern hemisphere. The project involved several years of meticulous observation and recording. The results are interesting and important, as they are the first to deal in a scientifically robust manner with a controversy that has dogged wildlife gardening for many years: are native plants better for wildlife? 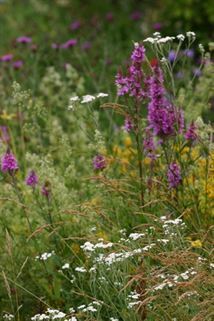 Emphasis should be given to plants native to the UK and the northern hemisphere. There are over 3,000 species of moths in Britain. Many are found in gardens. Much is still to be discovered about their feeding preferences, in particular to what extent adult moths take nectar from flowers, and what flowers they use. The study of moths is one of those areas where ordinary gardeners can still make a big contribution to our knowledge. Moth Night is the annual celebration of moth recording throughout Britain and Ireland by enthusiasts with local events aimed at raising awareness of moths among the general public. Find out about how to get involved by visiting the Moth Night website.